The final installment of the London via Lagos series - Lydia Adetunji’s Fixer – leaves the London of Arinze Kene’s Little Baby Jesus but is equally penetrating in dramatizing the links between these two influential cities. Set this time in Nigeria - with an authentic feel to the dialogue, script - the grand themes investigated here are universal. 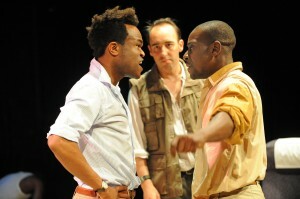 Adetunji, who is the Paines Plough playwright-in-residence explains political issues through a cast of seven credible characters in a compelling story which uncovers the corrupt and corrupting influence of oil exploration and the global business which attracts foreign correspondents to an already volatile region. Adetunji used to be a journalist with the Financial Times and she brings her experience to bear on this play - the ambitions of journalists and the ethics of the profession; and Nigeria where she grew up before returning to Britain. These experiences are mirrored in this well-received, expertly-written piece, which was first performed two years ago at Suffolk’s HighTide Festival. The play introduces us to the dilemmas faced by people on the margins of global business where deception, treachery, political chicanery and the debasing influences of geo-politics are all revealed. It's also full of humour and comedy, especially the hilarious adaptability and poetry of the language of Nigeria. However, this did not overshadow the gravity with which the writer deals with her subject. Rather it's the coping mechanism used by her characters to rationalise their miserable desperation, unseemly compromises and the moral dead ends in which they become entrapped. Richard Pepple in the lead role as Chuks the Fixer of the title is assertive, confident, suspicious and cocky in a persuasive performance, as is Damola Adelaja’s apparently naive Laurence whose innocence hides ruthless ambition. And their colleagues expertly capture the uncertainty and desperation of uncertain situations. Co-Directors Dan Barnard and Rachel Briscoe are economical with the resources available to them. Whilst duos or trios of characters exchange views and dialogue which pushes this dramatic story forward the remaining cast prowl the Oval House’s mostly bare floor level stage in a skilfully choreographed parallel story without words. Who is more corrupt, more grasping, more duplicitous, more opportunist? The international institutions lauded as legitimate and above reproach - where the framework of accountability only serves to hide wrong doing and scheming? Or is it the threatening but rarely seen presence of The Boys waging their anti oil pipeline armed campaign? Or is it the compromised journalists who make all sorts of compromises to survive, opportunistic public relations experts called upon to defend the indefensible; or people caught up in the periphery of this world and who exploit it for the small change which falls from the pockets of the more wealthy? Lydia Adetunji's absorbing and entertaining play illustrates the difficult options made by individuals on all sides of this conundrum – and the tensions between them. This writer shows that there are no easy questions or parallel answers; and the shallow presentation of manipulated news coverage only serve an unpleasant but lucrative game - for news organisations and multi-national corporations anyway. This is a serious play about critical issues written by a writer with a sharp eye for dialogue, a cogent and intelligent analysis of international affairs and a clear perspective on the impact of these matters on the different hierarchies on the edge of international politics and business. We need more political drama likes this! Book online www.ovalhouse.com (no fee).